In order to increase jobs and prosperity in Kansas, we should seek to reduce state spending as much as possible, thereby leaving more resources in the productive private sector. In the debate over reducing and eventually eliminating the income tax in Kansas, those who oppose income tax reduction say it will simply shift the burden of taxation to others, in the form of sales and property taxes. This is true only if we decide to keep spending at the same level. We could cut spending in response to reduced revenue, but it is argued that state spending is a good thing, a source of wealth that Kansas should continue to rely on. The idea that government spending is a generator of wealth and prosperity is true only beyond a certain minimal level of spending. We benefit from government provision of things like national defense, public safety, and a court system. (There are those who believe that even these could be provided by the private sector rather than markets.) But once government grows beyond these minimal core functions, it is virtually certain that markets — that is, free people trading in the private sector — can produce a wider variety of better goods and services at lower cost. We also have to realize that government spending has a cost that must be paid. Advocates of government spending point to the salary paid to a government worker and how that money gets spent in the economy, producing jobs. These advocates, however, do not recognize the source of the worker’s salary, which is money taken from someone through taxation (or through borrowing and inflation at the federal government level). The loss of that money to government has a cost in the form of the reduced economic activity of those who paid the taxes. If this loss was economically equivalent to the gain, we might be unconcerned. But there is a huge cost in taxation and government inefficiency that makes government spending a negative-sum proposition. Another fundamental problem with government taxation and spending is that it is not voluntary. In markets, people voluntarily trade with each other because they feel it will make them better off. That’s not the case with government. I do not pay my taxes because I feel doing so makes me better off, other than for that small part that goes to the basic core functions. Instead, I pay my taxes so that I can stay out of jail. This fundamentally coercive nature of government spending gets it off to a bad start. A look at the membership role, however, lets us know whose economic roots are being stimulated. Membership is stocked with names like AFL-CIO, Foley Equipment Company, Heavy Constructors Association of Greater Kansas City, Kansas Aggregate & Concrete Associations, Kansas Asphalt Pavement Association, Kansas Contractors Association, Kansas Society of Professional Engineers, and PCA South Central Cement Promotion Association. Groups and companies like these have an economic interest in building more roads and highways, whether or not the state actually needs them. They would happily build a highway to nowhere. As Miron explained, groups like this will spend almost unlimited money in order to receive appropriations from the government. It’s easier than competing in markets, and that’s a big problem with government spending — decision are made by the centralized few, not the many dispersed actors in markets. Some argue that without government spending, certain types of goods and services will not be provided. 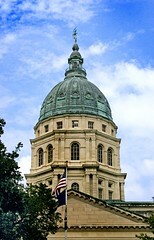 A commonly cited example is education, which accounts for about half of Kansas general fund spending. Would there be schools if not for government? Of course there would be. There are many non-government schools now, even though those who patronize them must first pay for the government schools before paying for their own schools. And there were many schools and educated, literate Americans before government decided it need to monopolize education. Those who still argue that government spending in education is for the good of everyone will also need to defend the sagging and declining performance of public schools, persuading us that government schools are producing an educated citizenry. They also need to defend the capture of Kansas spending on schools by special interest groups that benefit from this spending. That brings us to the second argument for higher spending: the Keynesian claim that spending stimulates the economy. If this is accurate, it might seem the U.S. should continue its high-spending ways until the recession is over. But the Keynesian argument for spending is also problematic. To begin with, the Keynesian view implies that any spending — whether for vital infrastructure or bridges to nowhere — is equally good at stimulating the economy. This might be true in the short term (emphasis on might), but it cannot be true over the long haul, and many “temporary” programs last for decades. So stimulus spending should be for good projects, not “digging ditches,” yet the number of good projects is small given how much is already being spent. More broadly, the Keynesian model of the economy relies on strong assumptions, so we should not embrace it without empirical confirmation. In fact, economists find weak or contradictory evidence that higher government spending spurs the economy. Substantial research, however, does find that tax cuts stimulate the economy and that fiscal adjustments — attempts to reduce deficits by raising taxes or lowering expenditure — work better when they focus on tax cuts. This does not fit the Keynesian view, but it makes perfect sense given that high taxes and ill-justified spending make the economy less productive. The implication is that the U.S. may not face a tradeoff between shrinking the deficit and fighting the recession: it can do both by cutting wasteful spending (Medicare, Social Security, and the wars in Iraq and Afghanistan, for starters) and by cutting taxes. The reduced spending will make the economy more productive by scaling government back to appropriate levels. Lower tax rates will stimulate in the short run by improving consumer and firm liquidity, and they will enhance economic growth in the long run by improving the incentives to work, save, and invest. Deficits will therefore shrink and the economy will boom. The rest of the world will gladly hold our debt. The U.S. will re-emerge as a beacon of small government and robust capitalism, so foreign investment (and talented people, if immigration policy allows) will come flooding in. In Kansas, we need to scale back government to appropriate levels, as Miron recommends. That means cutting spending, as that is the measure of the size of government. That will allow us to cut tax rates, starting with the income tax. Then we in Kansas can start to correct the long record of sub-par economic performance compared to other states and bring prosperity and jobs here.